Most of us think of the vitamins and minerals in fruit and vegetables when we think of why they are so good for us, however this is just part of the picture! When it comes to weight loss / maintenance (and disease prevention) the energy density of food plays a vitally important part. It’s easy to determine which foods have high energy density and should be limited! Fruit and vegetables on the other hand have loads of water, and very little fat making them low in energy density (low in calories gram for gram) and that’s an extremely good thing! Energy Density can help control hunger! One of the mechanisms that controls hunger is when the stomach is full, a signal is sent to the brain to tell you to stop eating. One of the problems with energy dense foods such as chocolate and crisps is that you can eat an awful lot of them before you begin to feel full. Because the volume (bulk) of the food you eat directly affects how full you feel, its super important you consume plenty of vegetables and fruit (Low energy density foods) every day. Fruit is usually much more energy dense (has more calories gram for gram) than vegetables, meaning that when you aim for your 5 a day, vegetables are better than fruit however fruit is better than chocolate / crisps etc and progress is progress. Not only is being overweight awful for confidence, increases your risk of heart attacks, diabetes and depression (to name but a few), it also significantly increases your risk of developing a number of different cancers! 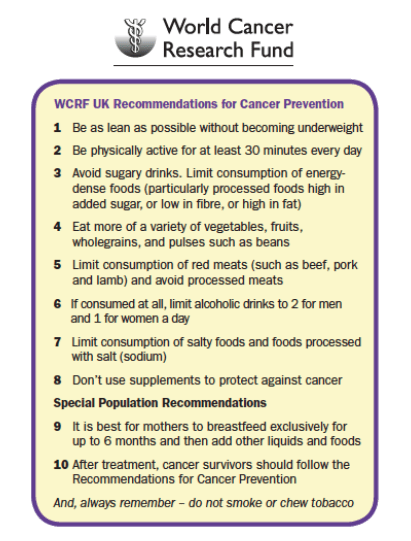 Below are The World Cancer Research Funds recommendations for reducing your risk of getting cancer. So as you can see, eating more fruit and vegetables not only will help with weight loss / weight control, it will also significantly reduce your risk of getting a number of different forms of cancer! Put simply, eating too much energy dense food makes us far more likely to consume more calories than we need which in turn leads to gaining weight / having difficulty losing weight. Sadly, the range of processed / convenience foods we have available nowadays makes this more likely to be the rule than the exception. Energy density directly affects how many calories you will consume, and how many calories you consume will directly affect your weight! In my opinion, I don’t think its possible to lose weight and keep it off, or maintain your body weight unless you eat plenty of vegetables and fruit, so if you don’t do this already I’d urge you to start making some changes! 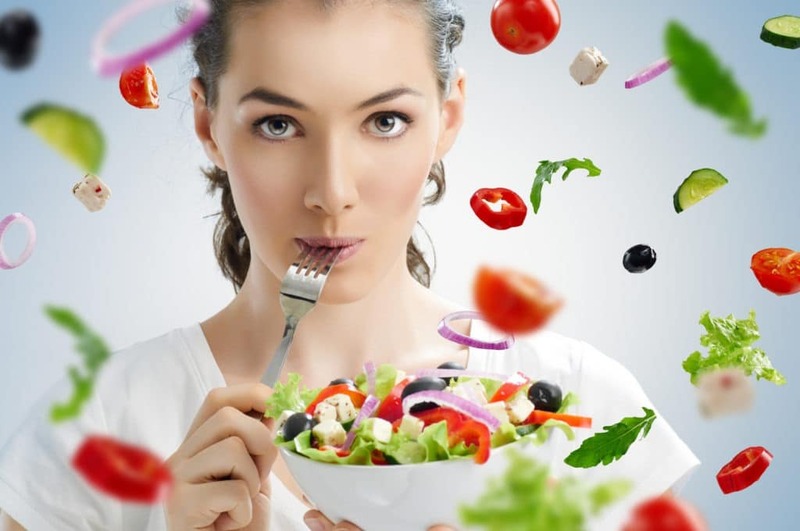 Take Action: Increase the amount of vegetables and fruit that you eat! Start small by adding side salads and fruit, or decreasing your evening meal potatoes / rice /pasta and adding some steamed / microwaveable veg! Try focusing on this one area for a month and see what a difference it makes for you! And just incase you need a little extra motivation: Swapping a chocolate bar for an apple very day could save you over 100 calories a day. Over the course of a year that’s a weight loss of over 12 lbs from one simple swap! Many thanks for taking the time to read my post. I hope you enjoyed it!